Amores! This is my absolute favorite time of the year! I love the music, the traditions, my family coming over to visit, and everyone being happy and full of Christmas spirit, verdad? I remember one Christmas cuando era niña we had a huge family reunion (como hacen los Mexicanos) and everyone came over! My tias had made champurrado and menudo and Doña Carmen from church made several dozen tamales for us to have at our party! I had primos come from the east coast, from West Texas, from Mexico…we had family come from everywhere! Y mira, nomas…we had the best time! At one point during the evening, we pushed all the sofas aside so we could play music and dance the night away! N’ombre lo pasamos super bien! My abuelo and abuela even danced together! Ay, que memorias! Reynas, these are the types of memories I want to make sure I pass down to my children as well. It’s so important that we pass down all the wonderful things about our culture! What traditions do we have as Mexicans that make the holiday season great you ask? Bueno, aqui les digo! while we celebrate this in our Mexican tradition, it’s also important to know that our brothers and sister in most of Latin America carry this tradition with their families too! Posadas are meant to celebrate the journey that Mary and Joseph took from Nazareth to Bethlehem. They start on Dec 16th and go for 9 nights until Christmas Eve, amores! There are carols sung and a procession that goes from house to house until the host of the celebration house lets everyone in. Celebrations can be big or small, but they are religious in nature and include bible verses, prayer and a reflection on the events leading up to the birth of Jesus. On each of the nine nights a different quality will be meditated upon: humility, strength, detachment, charity, trust, justice, purity, joy and generosity. After the service, there is food like tamales and menudo or atole and the children break piñatas in celebration! Ay! Las pastorelas! When I was a little girl, I remember playing a sheep, Mary and a burro at different times in my church pastorela. Que emocion! 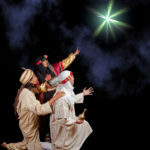 Pastorelas are plays that depict the journey of the shepherds and the three wise men as they follow the Star of David to Bethlehem to meet the Christ Child. 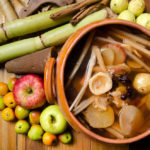 Did you know that the first pastorela was actually written in Nahuatl and it dates back to 1536! Pastorelas tell the story with music, songs, and performances by all the actors on the stage. If you’ve even been a burro in a pastorela, then you know that even the burro gets to perform on that day! It’s a beautiful tradition that includes even the children in the family. No Mexican household would be complete with the nacimiento. The nacimiento is the nativity scene and St Francis of Assisi is credited with making the first nacimiento in an Italian cave in 1223! Amores,you know how for Dia de los Muertos we create these lavish altars for our loved ones who died? Well, the nacimiento is similar in detail but on a smaller scale. 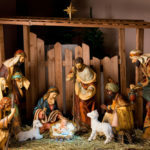 The figures are usually made of clay but include Joseph, Mary, baby Jesus, the animals in the manger, angels, shepherds, and the three wise men. The most beautiful thing about this tradition is that the nacimiento is passed down from generation to generation so it’s not uncommon to see some that are many, many years old and worn from the years of being passed down. In this tradition, the baby Jesus is placed in the manger on Christmas Eve. Nochebuena is our biggest feast during the holiday season. 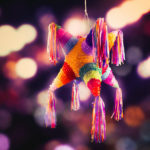 I remember many of my friends in school celebrating Christmas day and waiting for Santa Claus to come, but for us Mexicans, it was all about the nochebuena. On this night, we gather with all of our families and eat things like tamales, champurrado, menudo, buñuelos, ponche and even bacalao! Yes, fish on Christmas Eve. It’s delicious! Usually we also go to midnight mass as a family and then place the baby Jesus in our nacimiento when we get home. Nochebuena is a wonderful evening of music, celebration, togetherness and unity within the family…all to celebrate the birth of Christ. Do you have your colored underwear and grapes, amores? Well, for the ropa interior it’s important that you dress for the part! 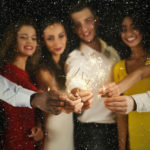 If you want more love and passion in 2019, wear red; for health and well-being, wear green; for wealth and prosperity, make sure you wear yellow; for true love and friendship, wear pink and for hope and peace, bring out your white underwear. Skip the black colors ok, amores? As the countdown to midnight begins, eat the 12 grapes one at a time and make a wish for each one. And don’t forget to write down your goals and wishes for the new year! Reynas, we have so many celebrations during this wonderful season as so many loved ones walk through our door during this special time of year! It’s important that we create these memories with our families and continue to pass down our traditions. At Juanita’s, we are honored to be a part of your family table during the holiday season and in the years to come.